Windows 8 is the newest version of the windows operating system from Microsoft. It has not been released yet and is assumed to be released in the next few months. With Windows 8, Microsoft wishes to have a single operating system that can be used from PCs to laptops to tablets and mobile phones. In this way Windows 8 is much different from the Windows 7 that was based on the same line of Windows Operating System. Microsoft is looking to make its mark in the mobile phone industry with its Windows 8 Operating System, as its previous Windows Phone 7 couldn’t live to expectations and projections show just a 5% share of windows phone in the mobile market in 2012. Microsoft has realized that the new trend in smart phones is going to cut the demands of the PCs where Windows rule. Therefore, Windows 8 has been custom designed with tablets and handheld computing devices in mind. This is the reason for two of the most prominent features of Windows 8. The metro user interface is the one used in Windows Phone. The traditional desktop of the Windows has been placed in an application tile on the new desktop. 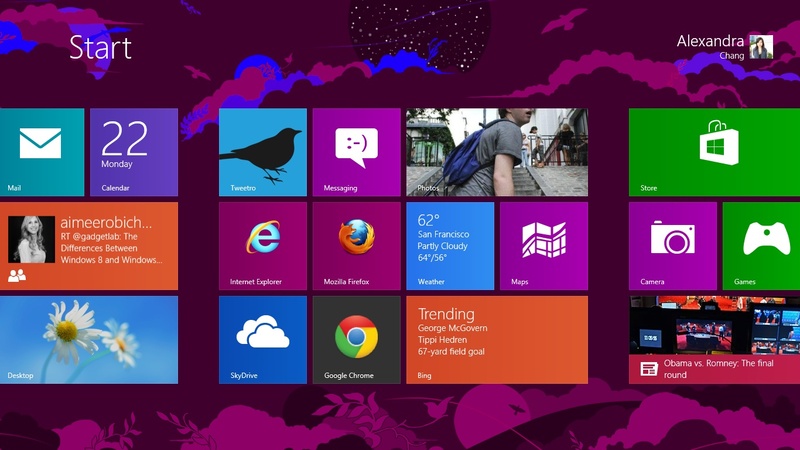 The new tile based screen is the desktop of Windows 8. Each tile on the screen will represent an application that will have it status on the tile. The status of a tile would inform about relevant information related to the application. Different tiles would be able to communicate with each other. Such applications would be available from the Windows Store. In order to get its share in the mobile phone market, Microsoft needed to improve its touch input. Without precision touch, the experience of using smart phones is not much enticing. In order to have high precision touch technology, Microsoft has used the fuzzy high targeting. Another thing that had to be changed for Windows to be successful on tablets and mobile phones was its loading time and power usage. The developer preview released by Windows 8 shows that Microsoft might have been able to solve this issue for its Windows. Moreover, the memory footprint left by the Operating System is much better compared to its previous versions. Apart from the changes made to enhance the Windows to capture the mobile phone market, there are many other exciting features added in the Windows 8. The windows browser would be included in the operating system as an application tile. It has a built in adobe flash player. The browser is made to provide the best experience for touch. The ActiveX support has been withdrawn from the mobile version, whereas the Desktop version of the Windows 8 would include the complete version of Flash Player. The Windows 8 has provided an extra authentication method in addition to the username password authentication method. The other method constitutes of selecting a picture and drawing three gestures on the picture on different places. This is an exciting new addition to the Windows 8. Task manager has also been revamped in the newest version of the Windows Operating system. In Windows 8, opening task manager shows only the applications running on the system. More information can be seen by clicking a ‘More Details’ button. The new task manager also informs about the hard disk space and network bandwidth an application is consuming. The enhanced task manager also informs about the history of different applications used. The application used the most amounts of time and the hardware space and network bandwidth used by the application. Microsoft has quiet liked the Ribbon UI, it introduced in its MS Office 2007, and again used in MS Office 2010. In Windows 8, the Ribbon User Interface is used for windows explorer. Customized just like Office, the Interface makes it easier to copy, paste files and perform other functions on files and folders. The Windows 8 has also got an antivirus built in its kernel. This has been kept to enhance the security of the Windows operating system. The Windows 8 also provides its users with the Xbox live feature available on the Xbox gaming console of Microsoft. In addition, the touch feature of the operating system requires a touch input screen. The new version of Windows 8 has got a lot of applications to run on it. All the applications are available on the Windows Store. This is when the Operating system has not even been launched. This is the most important arena where Windows would have to compete against mobile phones, especially apple. The vast array of applications available for Apple iPhones set them apart. If the Windows 8 is to be popular among users, it also needs to have a comparable range of applications to lure the users onto its platform. With all these additional features Windows 8 would surely be a hit for the PCs. However, how much would it be able to make a mark in the mobile phone market is anybody’s guess. Microsoft has taken a big gamble by producing a one Windows for all platforms in the form of Windows 8. They would be hoping that the gamble would pay off, and they would be able to transfer their dominance from the PCs to the mobile phones.